What we can accomplish in a blog post, however, is to familiarize ourselves with some of the more manageable problems facing library staff/faculty that manage 3D printers. For context/ethos, I run a fleet of Lulzbot Taz 6s and Minis at the University of Oklahoma across two locations: Innovation @ the EDGE in our main branch— The Bizzell Memorial Library; And the Couch 3D Printing space — a small 3D printing lab nestled in a former IT helpdesk in one of the OU residence halls. In my experience managing 3D printing services, safety concerns like filament knowledge and responsible chemical use, intellectual property concerns and copyright infringement issues, immediate physical dangers like the risk of burn, laceration, or shock are the real immediate and present risks. Not to mention the risk of malicious attack on Raspberry Pi based printer servers, but we will get back to that. 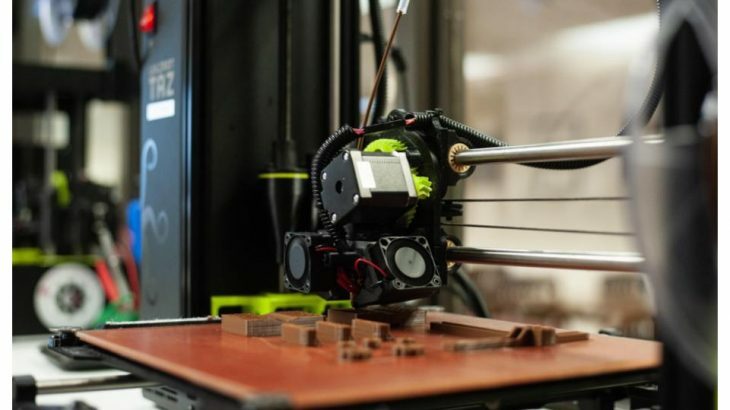 All emerging technologies professionals need to be aware of these risks and how to mitigate them before they begin offering 3D printing services. The good news is that they are very manageable dangers and shouldn’t dissuade any organization from turning away from 3D printing if they have the financial support and the patron demand. The first issue I’d like to discuss is responsible filament education. If you are going to print with strictly Polylactic Acid (PLA), you can probably skip this section. At OU, we primarily use eSun 2.85mm PLA ordered off of Amazon for our PLA needs. This is as much to do with tradition and ease of ordering for our admin staff as it is to do with its reliability, cost, and print quality. The material safety data sheet for eSun PLA indicates that it is extremely safe for human use. PLA is frequently used as implantable material in plastic surgery and has been for some time with very little negative reactions. The dust caused both by toothed drive gears and the sanding of filament, however, is a respiratory irritant. A respirator should always be worn while sanding any printed material or any other situation where dust from filament is present. Despite the relative safety of PLA, continue to check the MSDS each time you look to purchase PLA from a new manufacturer and keep them on hand for compliance and safety. At this point you may think, “Let’s move on to a different article. This guy is talking safety data sheets” and up until one scary almost-incident I may have thought similarly. One day, a colleague brought in some Proto Pasta Stainless Steel Composite PLA. I was going to open it and start printing, but I had a tugging feeling that I should check the MSDS. Where I found the following:Not only are the inherent chromium and nickel risks enough to pass on this for use in our University Libraries, but one of our student employees had a severe nickel allergy. I’m very glad we read those sheets and didn’t open the package. Since this almost-incident, we only order filament that has a MSDS we can read prior to ordering. All the material research in the world won’t save us from the burdensome beasts that are the intellectual property (IP) issues that are swiftly approaching all 3D printing professionals. 3D printing inherently comes with a plethora of copyright issues. So, what is left at the bottom of the box now that all those issues have fled? Certainly not hope for copyright owners. (FYI, this paragraph will be more out loud food for thought/contemplation than trying to give real answers). For example, shortly after seeing advertisements for a new “butter grater” show up on social media sites, I went into one of our labs and noticed several clones were sitting on our shelf of completed prints. What can we realistically do as librarians and library staff? We can advise people to make good, ethical decisions and inform them as best as we are able about the laws and regulations that govern what makes related actions “right” or “wrong,” unethical or not. We wouldn’t want the software or firmware to carry the DRM (Digital Rights Management) burden, either. Can you imagine if a process was shoved into the slicing or printing workflow that checked the to-be printed object’s dimensions against a database of copyrights, trademarks, and patents? 3D printers aren’t super complicated, but they would quickly become slower and exhausting to troubleshoot if you inserted some sort of IP protection like this. This issue is cerebral and hopefully the technology will evolve significantly before we have to deal with IP protection as a part of our workflow in managing these devices. What we need to safeguard ourselves against immediately, however, are the immediate physical dangers connected to 3D printing. These come in two types: accidental and malicious. 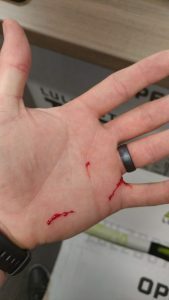 Injury caused by removing PLA supports without gloves. Lacerations were caused by the support material and needle-nosed pliers. With every good intention and forethought to safety, I have burned and cut myself exactly one ton of times thanks to 3D printers and 3D printing. The best advice I can give is to take your time and — as often as you can — work with heat resistant gloves. The link in the last sentence are the exact ones that I use. I have dropped freshly unscrewed nozzles that were at 250c straight onto those without issue. Now, you should never use this to hold onto something for a prolonged period of time, but they should protect you from most incidental contact. Burns aren’t the only danger, I have also managed to cut myself pretty well a few times dealing with prints. This generally occurs when I am removing a print that is stuck to the print bed or when I am removing printed supports. The lacerations shown in this image came from PLA support material and some needle nose pliers. Be careful; wear gloves. Although, they would be clunky and awkward, the same cheap gloves from above can prevent damage like this. To date, I haven’t been shocked (*Bobby reaches over and knocks on a spool of wood composite PLA*) and have not been given a reason to fear shocks as long as I am observing basic electrical safety precautions. All the on-site safety in the world won’t help you if you haven’t password protected remote access to your printers, however. When I first read about the staggering number of OctoPrint servers with online access and no authentication, my immediate thought was of 4000 houses, schools, and libraries burning down and (shamefully) how it would blemish the tech in a way it could never recover (sometimes I spiral thinking of harms). When I read through the articles, however, most writers were concerned with the potential for messed up prints and the leaking of private product designs… WHAT?!? You have a machine that someone can find using an IoT search engine that can burn down your house and you’re concerned they may replace your Apple Pencil Case print with a Microsoft Surface Stylus Case print? That is crazy. There are FAR BIGGER CONCERNS! OctoPrint has since released a safety guide to ensure the security of your web access. Or you could simply not have your OctoPrint servers be remotely accessible. Part of me wanted to get out my grey hat, develop a script to hunt out all 4K servers, and lock them out with a notice that advises them to set a password and of the danger their lack of attention could cause. But I don’t know enough. Is that illegal? How much would that cripple my home network to run? Where are my drunk and amazing after hours MIT guys? I can help (I really can’t. You are much smarter in this realm than I am). So to the 3D printer manager or professional considering adding 3D printing as a resource, be sure to lock them down. Be sure you or whoever is working with 3D printers is safe, patient, and ready to do a ton of troubleshooting and research. It is an amazing technology and I feel crazy lucky to live in a time when I get to work with them on a daily basis. What do you see as the most pressing dangers connected to 3D printing? How can we solve them? What is your best 3D print? Show it off. What is your favorite 3D print? Why is it your favorite? Emerging technologies, Original Content 3D printing, intellectual property, Technology Management. permalink. Thanks for reading, Jennie. What kind of space is your Form2 in? What do your patrons primarily use it for?